You may notice something a little different when you receive your scanned photos back this month. ScanMyPhotos, which has digitally preserved more than one-hundred million photo memories, is supporting Breast Cancer Awareness Month to promote the need for the early discovery of breast cancer. Every photo scanning order processed by ScanMyPhotos during the month of October will be preserved on a special pink-colored DVD. Additionally, a portion of the proceeds from each photo scanning project will benefit organizations that support breast cancer research and education. “Proving these custom designed pink DVDs, which archive generations of photo memories will help draw awareness to early detection and awareness of breast cancer to save lives. 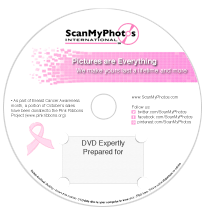 Every ScanMyPhotos customer has in some way been touched by breast cancer and the pink-colored DVDs will draw added attention to inform people in ways to take action against breast cancer,” said Mitch Goldstone, President & CEO of ScanMyPhotos. National Breast Cancer Awareness Month is an annual, international health campaign, organized by major breast cancer charities. Each October, extra emphasis is given to increase awareness of the disease and to raise funds for research into its cause, prevention, diagnosis, treatment and cure. In addition, Breast Cancer Awareness Month includes educating the public about early detection and also offers information and support to those affected by breast cancer. For a list of charities and foundations that help support breast cancer treatment, awareness and support visit the Charity Navigator. This entry was posted in Uncategorized and tagged breast cancer awareness month, charity, donation, photo scanning, pink, pink ribbon, scanmyphotos by Mitch Goldstone. Bookmark the permalink.